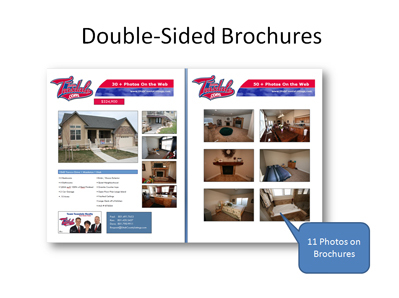 Team Teasdale Realty makes full color double-sided brochures for their homes. Over 90% of the homes in Utah County do not have brochures at all. However, buyer's grab brochures on homes they are interested in all the time. Our latest version of brochures now includes a QR code. This code will send the buyer directly to a full virtual tour of the home. Buyers are able to use their smart phone and instantly look at more specs about the home. Realtors that do not use brochures don't understand the value of brochures. Perhaps they are trying to save money. We know brochures help us sell our homes faster. We go thru about 50 brochures per month on each home. You can actually see our signs at night. Our signs are made with the same reflective technology as a stop sign. Combined with a solar panel, lighted brochure box, these signs make your home visible at night. We can put up a wood post or a steel framed sign for you. Our signs feature a large picture of the Broker, with his direct phone number. 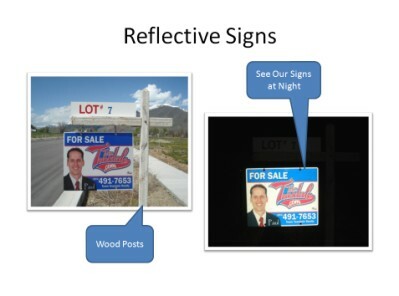 These signs are very bright and visible and are about 30% larger than most Utah Realtor's signs. Our signs span 36 inches in length. We want your home to be easily seen by any potential Utah buyers. Your sign will be installed the same day or within 48 hours of listing your home with Team Teasdale Realty. 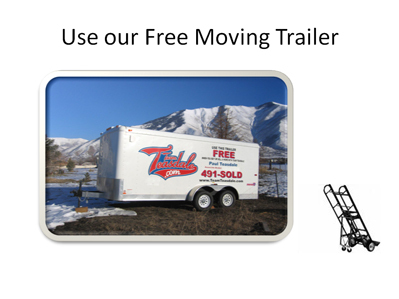 This trailer is 21 feet long, with a large loading ramp that drops all the way to the ground. This makes it easy to roll carts or 4-wheelers. We will loan this trailer to you for as long as you need. The typical family borrows our trailer for about four days. The trailer comes complete with a moving dolly and blankets, if needed. We will also provide the hitch and locks. We, at Team Teasdale Realty, want to not only make your Real Estate transaction simple and easy, but we also want to help make your moving experience a positive one.